Where most people really need help is with large expanses of glass — this is where the streaks are. The best and only way people in the business clean these kinds of windows is with a squeegee. It’s fast and fun once you get the hang of it. The squeegee you use is very important. Cheap equipment will do a poor job and you’ll get discouraged fast. Unger makes a good one and so does Ettore for about $15 — about the price of a decent wrench. This tool will make cleaning glass easy. You’ll also need a bucket of water — warm is nice, but it doesn’t have to be hot. The formula I like best is a pint of rubbing alcohol to cut any smoke film or grease, a squirt of dish detergent (e.g., Joy), and the rest water. I mix them up in the bucket, put on my window cleaning holster (in my case nothing more than a personal waist belt and a hammer clip that carpenters use to hold their hammers — $8 investment). I put one dryer-dried lint free rag in my right pocket, one over my shoulder and one behind me in my belt. Microfiber cloths work well too (see Unger or Ettore sites above). 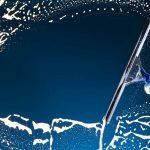 Two other tools that are invaluable for glass cleaning are a sponge or if you really want to be professional — a strip washer (again Unger and Ettore are good sources, though there are others too). A sponge is fine for low glass that you can reach. Dip your sponge about half way in, not all the way — this way when the solution goes on the glass it won’t be running down your arm, into your shirt, down your pants and into your socks. If your glass has bits of paint sticking to it or fly specks or pieces of scotch tape, don’t worry about dissolving that kind of thing, you simply take a $1 razor scraper, install a fresh blade, wet the surface of the soiled area, then scrape in one direction to avoid scratching the glass. You scrape in one direction because if there were any bits of grit on the glass, when you made a forward sweep you would pick it up on the blade and drawing the blade back while still in contact with the glass you would risk lodging that bit of grit between the blade and the glass thereby scratching the glass. Always use your scraper wet and go only one way with it to be safe. In wetting down the surface, be sure to cover all areas, but don’t get it too wet. It doesn’t take much liquid to clean glass. 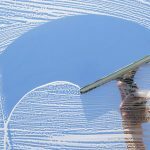 And here’s the advantage of a sponge or strip washer over say a window brush — you can control the amount of water that goes on the glass so that you’re washing the glass, not your face, the carpet, the floor, and innocent bystanders. After wetting the surface and covering all areas, you’re ready to squeegee. Take your squeegee, and starting at the top pull it down like a window shade. Usually working from the top down is best since you are directing all the water down. 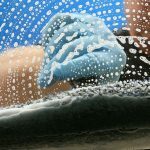 After each pass, wipe your squeegee blade with the lintless rag over your shoulder. This is very important since a too-wet squeegee blade will leave lines. Also, angle your squeegee just a little as you pull to control the flow of water. Be sure to overlap your strokes just a little and keep moving. Your speed will increase as you practice! 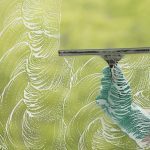 The best weather for cleaning windows is a slightly overcast sky, because the solution will not dry before you have a chance to squeegee it off. 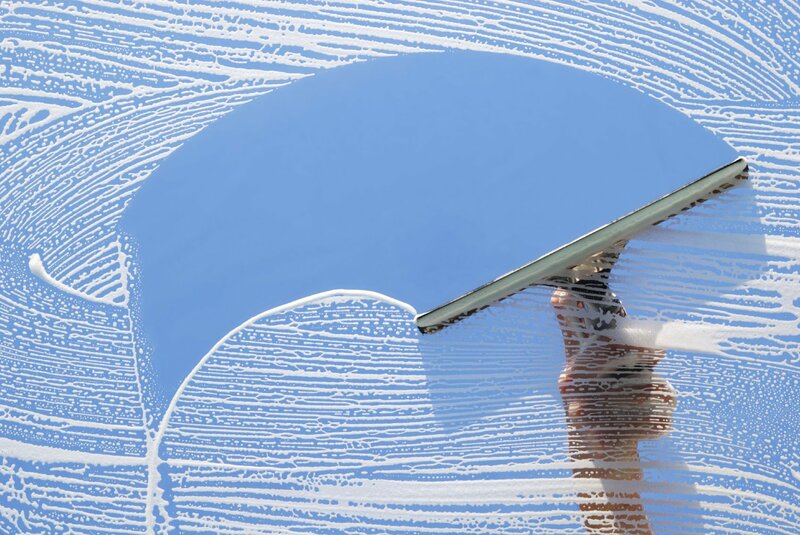 If you clean on a bright sunny day and your solution dries on the glass, just re-wet it and do the glass over again — if you don’t you’ll end up with water spots. 1. Your glass was very dirty and you didn’t spend enough time washing with your sponge before squeegeeing. 2. You didn’t overlap your strokes with the squeegee, leaving vertical water lines. What about high windows? In most cases, you never have to leave the ground. But you will need an extension pole and a strip washer rather than a sponge. The principles are the same. Remember to get yourself a holster to keep your hands free — besides it’s a great way to get some credit while cleaning your windows — with this on, you look like you know what you’re doing.